There's no quick fix. But with mindfulness, we can develop new skills to explore habits that undermine healthy eating. Have you ever noticed how anger can both motivate us and keep us stuck? Sometimes anger gives us the sense that we are doing something about a painful situation, troubling thoughts, or habits we don’t like. When it comes to disordered eating patterns, we usually aim the angry-finger at society, the media, our history, or ourselves. “There’s always so much food at every office meeting,” or “It’s the endless food commercials on TV,” or “I deserve this after a day like today,” or “If I had an ounce of willpower, I wouldn’t eat like this.” After we’ve aimed and fired, we often experience the backlash: an empty helplessness that leaves us feeling defeated, hopeless, ashamed and, once again, angry. All of these uncomfortable and unwanted emotions are often the very ones that drive our desire to eat—and often overeat—foods that soothe us, comfort us, and relieve and suppress those very emotions. These feelings often seem to take over and immobilize us to the point where we feel we have no choice but to eat, purge, or deny ourselves. As a way of taking better care of yourself, try taking one breath in and out before each bite of food, or pause to notice the color, texture, shape, smell, and taste of the food before you. Through the practice of mindfulness, we can develop new skills and the strength to explore the habits that undermine healthy eating. 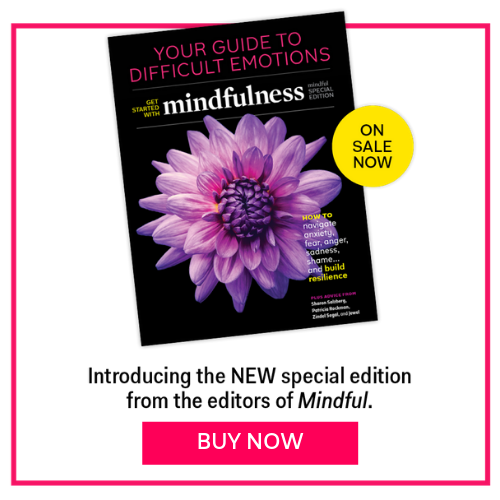 Mindfulness asks that we don’t ignore or pretend angry feelings don’t exist. Mindfulness means turning toward them even when that’s difficult. In time, with gentle curiosity, we can learn to be with those overwhelming feelings of shame, anger, sadness, and fear. Acknowledging that there is no quick fix, you might begin by experimenting with slowing down. As a way of taking better care of yourself, try taking one breath in and out before each bite of food, or pause to notice the color, texture, shape, smell, and taste of the food before you. By deliberately engaging your senses, you can bring a gentle curiosity to habituated and automatic behaviors that no longer serve you, and open the door of awareness that leads to healthier possibilities and choices. Char Wilkins, MSW, LCSW, is a mindfulness-based psychotherapist who works with individuals, couples and groups incorporating the intention and skills of mindfulness as a foundation from which to explore one’s life. She provides one-on-one consultation for professionals who wish to incorporate mindfulness into their work. She is a member of the Advisory Board of The Center for Mindful Eating and is the owner/director of the Center for Mindful Living and A Mindful Path in Connecticut.